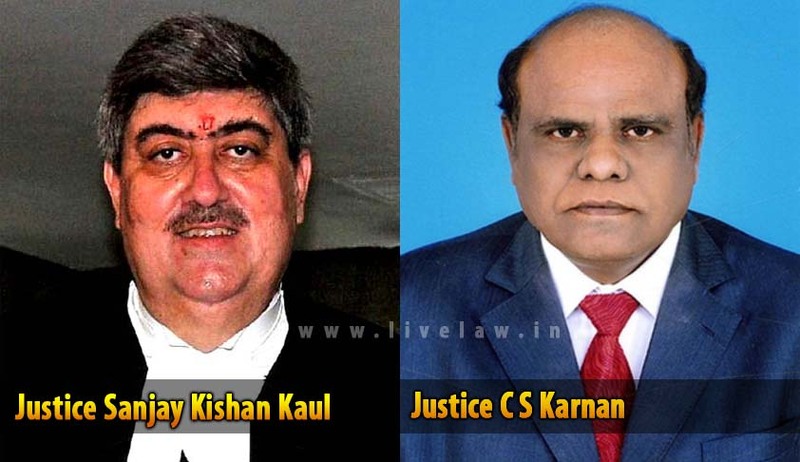 Madras High Court Judge Justice C.S.Karnan wrote a letter to Chief Justice Sanjay Kishan Kaul with copies marked to President of India and Chief Justice of India, accusing Chief Justice Kaul of Harassment and belittlement. He also stated that he is desirous of proceeding on long leave because of the harassment. “Since your Lordship is solely in-charge of the Madras High Court and invested with administrator power, Your Lordship has elected to allot me insignificant / dummy portfolios while those juniors to me, have been allotted significant assignments, Which is tantamount to belittling my capabilities as a judge of many years in this August Court. Being a Dalit do you expect me to take such treatment lying down ? Or do you expect me to fight for my rights till the bitter end ? It is with a heavy heart, I am desirous of proceeding on long leave as a result of the Harassment and belittlement meted out to me by Your Lordship and to ensure that the decorum of the Courts is maintained to the satisfaction of the general public, since I feel aggrieved even though I have established my cases with substantial backups. He stated in the letter. In another letter addressed to Law Minister Sadananda Gowda, he attacked the Collegium System. "It is most obvious that selection adopted by the collegium system is only to entertain their own favourites comprising close relatives, distant relatives and in the absence of the abovementioned choices, then the selection would go to close associates and good friends." He said. The controversy started with the Chief Justice Sanjay Kaul constituting the recruitment committee comprising of Justices V Dhanapalan, R Sudhakar, D Hariparanthaman, N Kirubakaran and R Mala to interview candidates for selection as civil judges. The Tamil Nadu Public Service Commission chairman and other officers were to be part of the selection committee and it was scheduled to start oral interview of candidates from April 15 till April 21. On April 16, Justice Karnan initiated suo motu proceedings and passed a judicial order questioning Justice Dhanapalan’s inclusion in the committee. He alleged that latter had produced “bogus educational qualifications” about his bachelor and masters degree in law, he had no locus-standi to conduct interview. “In order to control the mal-administration of My Lord Chief Justice, I am passing this suo-motu judicial order in the interest of justice invoking Article 226 of the Constitution to restore the confidence in the Madras high court and confidence with the general public,” he said and ordered that two judges must be from minorities communities – one from Muslim community and another from Christian community – to give a fair representation to all communities in the recruitment committee. On April 17, Justice Karnan’s suo motu order was placed before a division bench of Justices S Tamilvanan and C T Selvam, which stayed the April 16 order. The Madras High Court registry moved the Supreme Court seeking stay of the order passed by Justice Karnan.The Supreme Court had stayed the order passed by Justice Karnan.